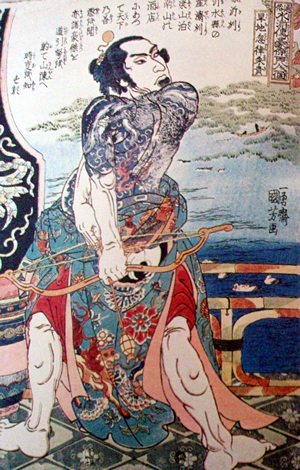 The following pictures are popular strong men’s ukiyo-e wood prints made in Edo period (1603-1868). 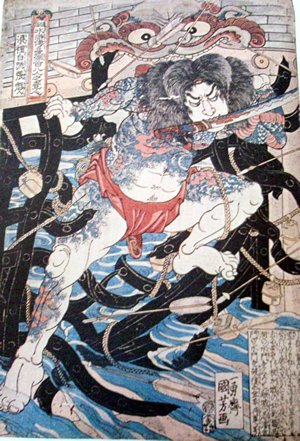 To the town-people in the period, having tattoo is something to show their courage against samurai. They tattooed these legendary strong men with respect. He is a master of swimming and his tattoo is a monster serpent. The scene is when he is breaking a water gate. This flower tattooed man has fantastic physical strength and uses 37 kg stick for combat. 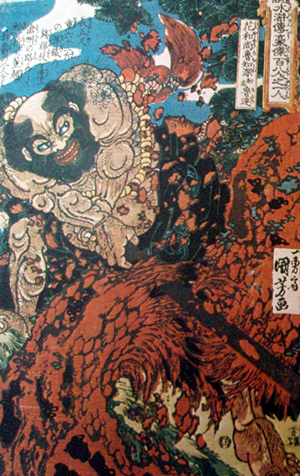 He is also a character in “Water Margin.” He has fox or wolf on his back. He is known as a fashionable man and unlike the other two above, he is a office worker rather than a fighter. The pictures are dynamic and the blue colors used in them are beautiful.